Right Brain (66%) The right hemisphere is the visual, figurative, artistic, and intuitive side of the brain. For most of central Texas, today is the first day of school. But not for me. I started Thursday. Despite what I said before, I have gone back to teach one more year at Texas State University-San Marcos. All summer I was job hunting and while some things seemed promising, there were few jobs I was actually really interested in. However, I've heard that it takes a month for every $10K worth of salary one was looking for and since it had only been three months, I expected it would take several months yet. Then I got a note from the university. They were in need of a PR teacher. I was already slated to teach one class and they asked if I would think about returning full time for at least another year. A raise was offered, as well as an opportunity to apply for a more permanent position, so I had to consider it. My class schedule was basically two days a week, which would allow time to grow my own business as well as the consulting business Doug and I are starting. I asked if I could have a similar schedule in the spring so I could continue my networking, and they said yes. There wasn't a lot of downside, so I said yes. It ended up that my one evening class didn't make, so I am back teaching the same three classes I did last year -- Intro to PR, PR Writing and two sections of PR Campaigns, all on Tuesdays and Thursdays. Additionally, I'm auditing a multimedia Web design class, also on TTH. Throw in five hours of office hours and I have a full day on each of those days, from 7:15 a.m. to 6 p.m.
Two weeks ago when I went to sign paperwork, I grabbed my mail from the summer, which included class evals and letters from the VP of academic affairs. The later informed me of certain students who, upon graduation, listed me as one of the professors who made a difference in their college life, along with any comments those students made. I had a half dozen from spring graduation and it was very touching. I also read my class evals. About 95 percent were extremely positive, with one student per class saying something like I was too hard and assigned too much work, I seemed to think this was the only class they took, etc., etc. etc. Of course, I took those for what they were worth -- after all, until they get a job where they are expected to work 50+ hours a week in a pressure cooker, they don't know what work is. I guess I must not be too disliked, both of my Campaigns classes are filled to the brim, with 20 students. The past two semesters the classes were capped at 15. The other section of Campaigns only has 13 students with 6 open seats. I'm sure there are reasons for that, but on Thursday, when the students started talking about the teacher for that section and the things he does, I put a moratorium on it. Hearing about him just raises my blood pressure and I wasn't going through it again this semester. Seeing the students, especially in one of my Campaigns classes, was like old home week. Now that it's my fifth semester of teaching, I've had many of the students, either in Intro or PR Writing. Two girls I've had in both, and realistically, they should get a different perspective from another professor, but I know that I'm the best and right now, they don't have much options. I think some of my friends thought I would be more excited than I am. It's almost like I'm resigned to teaching. That's not exactly right, but as hard of a decision as it was to leave, it was just as hard to return. Mentally, it took a lot for me to separate the identity of a teacher from who I was, but after several months, I had done it. Now I have to reconcile that part of me back into the whole. But it's only been one day and that was mainly getting to know the students. Give me a few more class periods to get into the swing of things, and then I'll be excited. From this weekend's Miss Teen USA pageant. If Miss South Carolina's answer is any indication, it's pretty obvious why one-fifth of Americans are clueless. We are closing on a new (for us) car this afternoon. 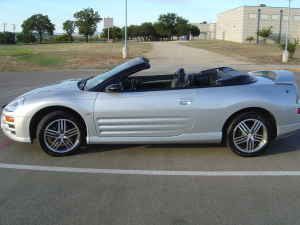 It's a 2003 Mitsubishi Eclipse Spyder GT convertible. Actually, it has really low miles and is under blue book, so we are getting a good deal. Plus Doug has been jonesing for a convertible since our last trip to LA when we rented one. Of course, I'm not sure why he thinks he'll get to drive it -- it's my car! One recommendation, if you are buying a used car, and are in the Austin area, be sure to use the AutoPI service. They come and check out everything with the car. We've used them three times now, once they saved us from buying a lemon and twice they confirmed we were getting good deals. Well worth the cost. Disclaimer -- this isn't our car, it's just the same make/model/year/color and looks exactly the same. We just don't have a photo of our car.